At a time, Assessee can select upto six Accounting Codes. This is a facility provided to the Assessee to make Central Excise Duty or Service Tax payments through internet, using net-Banking facility. How can I use this facility to pay Central Excise Duty or Service Tax? 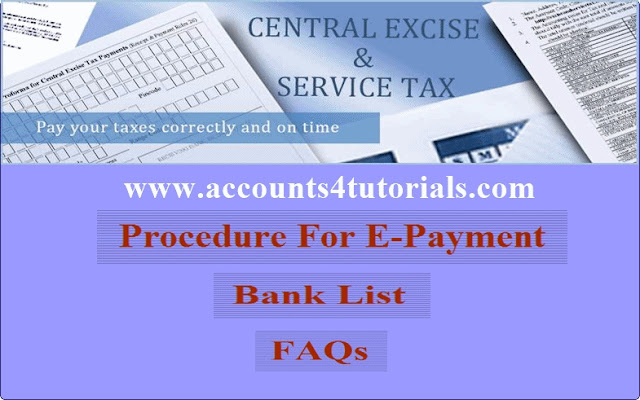 With effect from 1st October 2014, every Assessee shall electronically pay the Service Tax / Central Excise Duty payable by him, through internet banking vide notification 9/2014-ST and 19/2014-CE (NT) dated 11.07.2014 respectively. The list of Banks providing this facility is available on the NSDL-CBEC website. Alternatively you may get the information from your Bank. What is the procedure after being directed to the net-Banking site of the Bank? The system will direct you to net-Banking facility of your Bank. You will have to log on to the net-Banking site of your Bank using your login ID and password/PIN provided by the Bank. The particulars entered by you at NSDL-CBEC website will be displayed again. You will now be required to enter the amount of tax you intend to pay for each accounting code selected and also select your Bank account number from where you intend to pay the tax. After verifying the correctness, you can proceed with confirming the payment. What will happen after I confirm the payment of tax at my Bank's site? Your Bank will process the transaction online by debiting the Bank account indicated by you and generate a printable acknowledgment indicating the Challan Identification Number (CIN). You can verify the status of the challan in the Challan Status Inquiry at NSDL-CBEC website using CIN after a week, after making payment. You will have to check the net-Banking webpage of your Bank's website for this information. If any problem encountered at the NSDL-CBEC website while entering non-financial data then write to us at easiest@nsdl.co.in. The subject should indicate 'Online Payment of Indirect Tax'. Your Bank provides facility for re-generation of electronic challan counterfoil kindly check the Bank website, if not then you should contact your Bank, request them for duplicate challan counterfoil. After making e-Payment of Excise or Service tax if status of challan is not available under Challan Status Enquiry on NSDL-CBEC site, what should I do? You can verify the status of the challan in the "Challan Status Inquiry" at NSDL-CBEC website after 5 to 7 days of making e-Payment. In case of non availability of the challan status kindly contact your Bank. If I encountered any error on CBEC site while making e-Payment what should I do? If encountered any error on e-tax website kindly write to us at easiest@nsdl.co.in. The subject should indicate 'Online Payment of Indirect Tax'. If during the transaction or after completing the transaction Bank site encountered any error or get disconnected before generating Taxpayer counterfoil then instead of doing the same transaction again kindly check your account, if account is being debited then contact your Bank for regeneration of taxpayer counterfoil . Please note in the above case do not make the same transaction again which will result in account being debited more than once for same e-tax transaction. All transmission through NSDL-CBEC website is encrypted and is with Secure Socket Layer (SSL) authentication. With respect to the Banks, it depends on the security measures provided by the Bank for net-Banking.